Recalling dreamy summers of my childhood, is B is for Betsy, a sweet lace pullover, perfect for warm weather and transitioning seasons. This is a top down, mostly seamless, lightweight knit. Simple reverse stockinette trims its edges, giving the patterning of its strong vertical embroidery lace center stage. 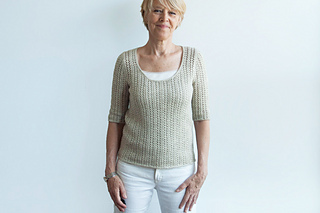 You’ll find this lace (an 8 st by 4 row repeat) to be enjoyable, engaging, and easily modifiable during the shaping of its scoop neckline and flattering, elbow-length sleeves. These are worked top down too, then in the round, and set in after blocking. B is for Betsy is a perfectly portable project yielding a fully fashionable result – enjoy! Shown in Finch by Quince & Co. (100% American Wool; 221 yds / 202 m per 50g skein); color – Audouin #157; 5, 6, 6, 7, 8, 8, 9 skeins or, for comparable yarn approx 980, 1125, 1300, 1415, 1580, 1710, 1840 yds / 895, 1030, 1190, 1295, 1445, 1565, 1685 m.
Long-tail cast on, cable cast on, circular knitting, decreasing (k2tog, skp, sk2p) and increasing (yo, RLI, LLI), lace shaping, stitch pick up around neckline, short row shaping at shoulders, blocking, and setting in sleeves. 14 page PDF includes pattern instructions, photographs, schematics, lace descriptions and charts with tips on making lace modifications at shaping points, row tracking grid for managing at-the-same-time instructions, and definitions for relevant abbreviations.